Adding accessories that pick up the nature around you. Creating a couple of intimate spaces including traditional Italian design elements, such as arches or iron railings. Remember, you don’t need to be perfect when transforming your home into a romantic Tuscan villa. Old-world charm is not precise. The rustic Tuscan color palette is very earthy, unassuming hues reminiscent of a Tuscan hillside. These colors include pale terra cotta, earthy red, olive greens, yellow-gray, yellow-blue, and blue-apricot. Touches of these colors could be found in sturdy furnishings, wrought-iron accessories such as candle sconces or light fixtures, painted tile, and textured wall finishes. Also, adding terra cotta tiles and stone with mosaic inlay would be the perfect finishing touch. Tuscan style is elegant, but not excessive. Bring a touch of that old-world charm into your home through décor that looks refined, warm, and gently aged. Below we suggest three ways to easily add Tuscan charm into your home. Dress a room with handful of decorative touches, such as an ornamental light fixture or a rustic carved wall piece. Deliver the charm of Tuscany through wood furniture embellished with carved or painted designs. Add touches of cheerful Tuscany tones through decorative pillow and window treatment fabrics. 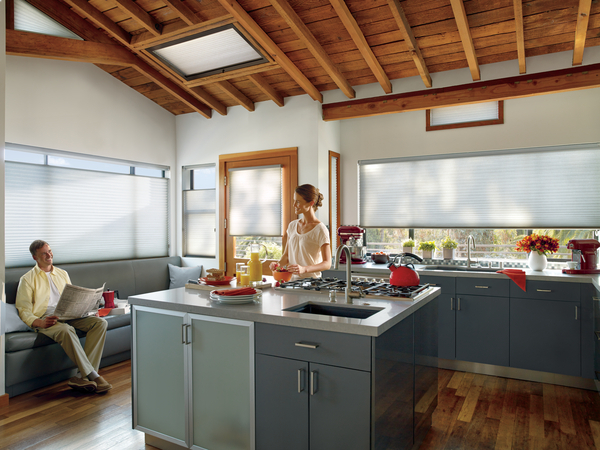 Today’s Hunter Douglas Design Studio™ Roman Shades do just that., with 320 timeless fabrics in an array of colors sourced from the finest mills around the world. This beautiful collection also includes 73 coordinating decorative tapes and trims. In addition to manufacturing the Roman Shades to your specific color and size, Hunter Douglas also makes all of the textiles available to purchase by the yard for the ultimate in coordination for custom-made accessories.